Respected public intellectual and award-winning writer John Ralston Saul will give a lecture exploring refugees and immigration at the Canadian School of Peacebuilding (CSOP) next month. Ralston Saul will present the lecture, titled, “Living with Uncertainty: The Road to Peace,” at 7:00 PM on Tuesday, June 14. He will speak in Marpeck Commons (2299 Grant Ave.) at Canadian Mennonite University. Admission is free, and all are welcome. A book signing will follow the lecture. The lecture arises from Ralston Saul’s observation that Canada is more and more isolated from its allies because, without exception, the United States and European countries are shaping themselves towards internal divisions and external fear. One of the curiosities of the continent is that every year over the last 70 years, it has received large numbers of immigrants, and yet it has never been able to admit that this would require massive changes in how they imagine themselves. In many ways, this crisis is all about an immigration continent, which cannot admit that reality, and so, has no immigration policy. In the lecture, Ralston Saul will posit that only by embracing concepts of uncertainty can they find ways to live together, both within their countries and with their neighbours. Declared a “prophet” by TIME magazine, Ralston Saul is included in the prestigious Utne Reader’s list of the world’s 100 leading thinkers and visionaries. His most recent book, The Comeback—an examination of the remarkable return to power of Aboriginal peoples in Canada—has greatly influenced the national conversation on Indigenous issues in the country. 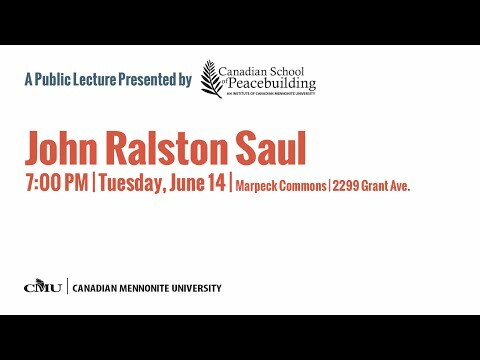 CMU caught Ralston Saul’s attention last year when he heard about a few significant events at the university, including a forum about the possibility of an urban reserve at Kapyong Barracks and the university hosting Iranian students from the International Institute of Islamic Studies in Qom, Iran. In addition to delivering the public lecture, Ralston Saul will co-teach the CSOP course “Reconciling Our Future: Stories of Kanata and Canada” with Niigaanwewidam James Sinclair. An institute of Canadian Mennonite University, CSOP is a learning community of diverse peacebuilders who come together to learn, network, and engage in peacebuilding. CSOP offers a selection of five-day courses each June that can be taken for professional or personal development, or for academic credit. CSOP is for peacebuilders from all faiths, countries, and identity groups. Learn more at csop.cmu.ca. © Copyright 2019 — CMU Media Archive. All Rights Reserved.